"I was looking in the mirror and couldn’t see the pupils in my eyes." People often come to StoryCorps to revisit the moments that shaped their lives. For Michael Yandell, that moment came one morning in 2004. Michael was 19 at the time and serving in the U.S. Army as a bomb disposal technician. He was on a routine mission in Iraq to clear explosive devices when he was exposed to the deadly nerve agent sarin — the same gas that was used in an attack in Syria in April 2017. He came to StoryCorps with his wife, Amy, to remember that day. Michael received a Purple Heart for his injuries from the exposure and is now doctoral candidate studying theology at Emory University. Originally aired April 28, 2017, on NPR’s Morning Edition. Top photo: Michael and Amy outside their home in Tucker, GA. By Todd Burandt for StoryCorps. 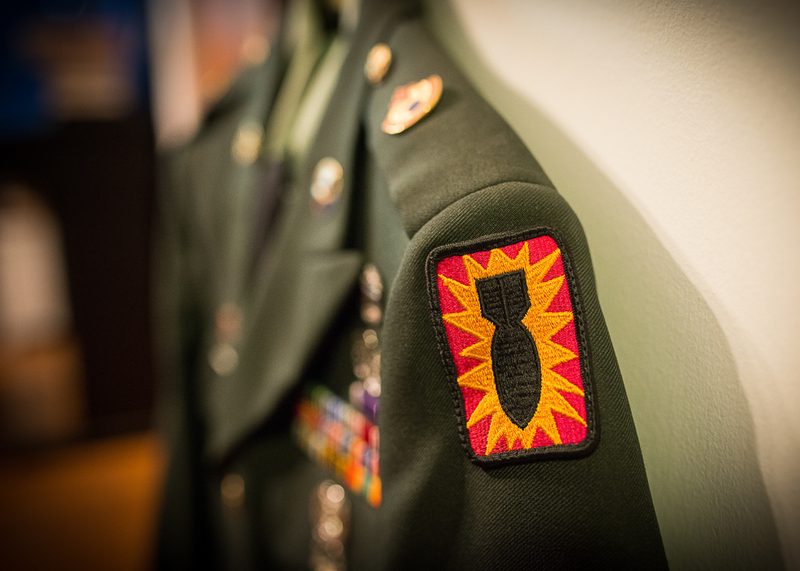 Bottom photo: A close-up of the Explosive Ordinance Division patch on Michael’s Army uniform. By Todd Burandt for StoryCorps. MY: We got a call very early in the morning, there’d been an explosion and there was a old rusted projectile in the middle of the road. I picked it up, put it in the truck, and I’m driving and my team leader’s beside me. We both had these crushing headaches. And um, you know we’re feeling disoriented, feeling confused, even. When we get back to the camp, I remember I was looking in this mirror and I couldn’t see the pupils in my eyes, the calling card of nerve agent exposure, and they told us to go the clinic immediately. We’d stripped down and they helped us shower because we were both having a hard time seeing and hard time really just using our faculties. I had a lot of fear and anxiety but I didn’t want to give voice to those fears because you don’t want to be unfit to serve and to be a good soldier I needed to be in control. And what the sarin proved to me is that I had no control and that’s a hard truth to come to terms with. How do you feel about me talking about it? AY: Well, as we both know, um, you don’t talk about this a lot. But I feel every day in you a wound in you. And not knowing how to fix it, not being your confidant when it comes to these things is hard. Because I love you and I want to help. And I’m sorry this happened to you. MY: Thank you. But in the scheme of things I was very fortunate compared to many other people. These weapons exist. They’re manufactured and used. Those decisions, they’re made by people who don’t ever encounter the reality. And the people that do encounter it, men and women and children, they don’t have any say.